This year’s Randolph Fair/4-H Theme – See you in Fairadise! Please read the tips on the back to present the best booth! The judging score card is so your club knows what the judges will be looking for and the dates for set-up and tear-down. Congratulations to Chadwick Sasala for completing Junior Pistol Workshop! 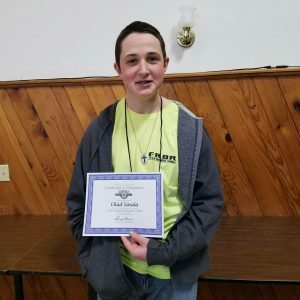 He is the very first Junior leader in portage county for shooting sports. Now with this certification Chad is allowed to help coach and be range officer on range days with Portage County Rangers. Great Job! Are you taking a Food & Nutrition Project and want to know how to properly prepare for Grade Day? There will be a workshop on June 2nd 10 am – noon at the Rootstown Methodist Church . The project requirements will be explained including the planning and writing of a menu, and completing the required portfolio. -Use of charts, posters, or pictures etc. statistics is required. (with sources cited)Talk should not include music, dancing, or singing as part of their speech. Scripts, notes, prompts, or cues may not be used. Trademark or brand names of products should not be used. NO note cards are allowed. No costumes allowed. No profanity or inappropriate words in speech or on clothing are allowed. There is a preliminary contest before the state contest. Must be original work of the member using crayons, markers, ink pen, etc. USING NO COMPUTERS OR SCRAPBOOKING TOOLS. MUST BE HAND LETTERED & DRAWN OR CUT BY HAND. Must be fully automated, stand alone presentation with sound. It should portray a message showing youth of 4-H age and be 2-4 minutes long. THESE ARE CONDENSED RULES FOR EACH CATEGORY. PLEASE READ THE COMPLETE SET OF RULES FOR EACH CLASS IF YOU ARE ENTERING. Portage & Mahoning County 4-H Camp is July 8 – 14, 2018. Open to all youth ages 8-13. The theme is “Camping Through Time”! *Please note this is not the same as registering for camp. Use the link above to register with your deposit to secure your place at camp.